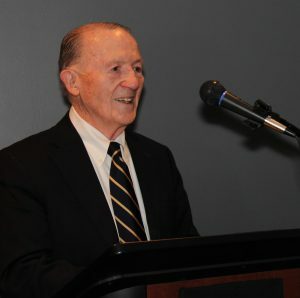 I first met Louis Giddings at an interview in University Hall in spring of my freshman year, 1957. I had applied for a campus job and the application asked for information about work experience, interests, etc. that might fit with campus hiring needs. By job, I assumed it would be something like waiting tables in the Refectory and was very surprised to learn that my interview would be with Professor Giddings, the Director of the Haffenreffer Museum. I had been interested in local (i.e. Providence, Cranston, Warwick) archaeology and accumulated a small collection of surface finds of arrowheads and other stone tools and had read lots on the subject and had been a member of the Narragansett Archaeological Society. Professor Giddings asked a few questions and offered me a position working with the Museum’s collections. I have never ceased thanking my lucky stars. Professor Giddings was the most kind and influential faculty member I knew at Brown. One of my most memorable early experiences with Professor Giddings was the trip we (he, Betts, Russell, Annie, Jimmy and I) took in the Giddings family station wagon to Lake Assowompset in Lakeville, Massachusetts. We were going there to visit Maurice Robbins, Director of the Massachusetts Archaeological Society, who was conducting an excavation on the shore of that beautiful and legendary lake. Robbins was in the midst of exposing an ancient village of circular lodges, the organic ruins of which could be clearly seen in contrast to the light sandy soil in which the wooden structures had been built and buried. Equally fascinating was the red jasper Folsom point that Robbins had recovered from the site that dated to the earliest inhabitants of this region, about which very little was yet known. I was most fortunate to be viewing these excavations and learning about the site with Dr. Giddings and Betts. We communicated easily from the beginning. On another occasion Dr. Giddings and I travelled to the Tomaquaug Valley near Westerly to visit a local landowner, Nathan Kay, who had been in touch with Dr. Giddings to inform him of archaeological sites on his property and to request him to give a professional perspective on the importance of these sites. We spent the day walking through the woods by the Tomaquaug brook and saw several overhanging stone outcroppings that well could have been used as shelters by prehistoric hunters. Mr. Kay invited us to excavate. We agreed that I would return to do some test excavations for a week or so. Dr. Giddings asked if I had done much camping and I hadn’t but was sure that I could. So I returned a week or so later and selected a promising shelter where I would camp for a week and do some archaeological testing. Since the site was protected from rain I had no need for a tent and planned to sleep on the ground. I learned quickly that even in summer the ground is a cold place to sleep even with a couple of blankets. It was in fact a shelter that was used over a fairly long period of time as was evident in the projectile points I recovered in the excavation. These materials, including an elegant side-notched red jasper arrow point, are now in the possession of the Narragansett tribe. 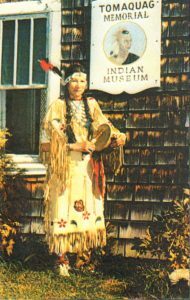 Postcard of Princess Redwing at the Tomaquag Memorial Indian Museum. We returned to this area again a couple of times to visit with Eva Butler, an anthropologist trained by Frank Hibben, who lived on a farm in Stonington, Connecticut, just across the state line from Westerly. Dr. Giddings knew Mrs. Butler, perhaps from the Hibben connection. She had been doing important ethnohistoric and ethnographic research among the Pequot, Mohegan, and Narragansett of this area for years. In her home she had an extraordinary collection of nineteenth and twentieth-century woodsplint baskets and other material items that due to her friendship with Princess Redwing she eventually gave to what became the Tomaquog Museum. I treasured these visits and feel so fortunate to have known Eva Butler and Princess Redwing—and to have had the opportunity to learn so much about her and her work among contemporary people. Dr. Giddings had been developing an interest in the ethnohistory of this region, and shared this interest with me. Bill Simmons and Steve Dyson excavating at Mt. Hope, 1957. 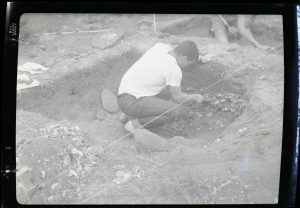 Later this summer (1957), Dr. Giddings encouraged me to look for other local archaeological sites and I was most happy to do. One was a site on the Haffenreffer property near the water’s edge below the Giddings’s house and the King Philip Throne. This was a late prehistoric Wampanoag site with some handsomely decorated Shantok style sherds. The day after I began this excavation (actually the evening after) the site was pilfered but we found out who was responsible and he desisted. Whether he found anything we never knew. A third site was in the Oaklawn section of Cranston by the ruins of an old mill or factory building by Meshanticut Brook. The site had been badly disturbed but the area itself showed dense prehistoric inhabitation. These objects and my notes went to the Museum. Getting to Bristol wasn’t easy. I took the Providence—Newport bus to downtown Bristol and walked to and from the Museum on weekends, often sleeping the night in the museum, learning about and organizing collections, sometimes leading visitors around the main hall, and identifying archaeological objects that people had found locally, reading books in the Haffenreffer collections, etc.. Discovering the history of the Mount Hope peninsula and of King Philip’s War, walking through those woods between Metacom Avenue and the Museum was a moving experience, as was the museum itself. Steve Dyson, who was a Classics major at Brown had already been working at the museum. We became very close friends. I greatly admired Steve’s learning and devotion to scholarship. I learned so much from him about archaeology, Roman history, Tacitus, Hadrian’s Wall, the “Eagle of the Ninth” and much more, all stored away in my consciousness. I will mention, among his many contributions to the Museum’s activities and programs the wonderful permanent exhibit he put together on the Archaic Period “Red Paint” culture materials that had been in Rudolph Haffenreffer’s original collections. Steve was a can-do person with great intelligence and curiosity, and an important influence on my own intellectual growth. The 2017 academic year marks the Haffenreffer Museum of Anthropology’s 60th anniversary with Brown University. "Sixty at 60" brings together people whose lives have intersected across six decades through their involvement with the Haffenreffer Museum. Their reflections will provide insights into the ways academic museums transform lives, inspire discoveries, and provide space for new conversations within and beyond the university.